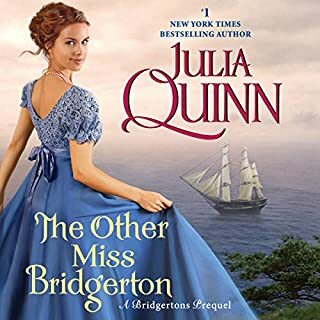 I forgot Julia Quinn's novels are enjoyable reads - 'reads' being the important word. Because in my opinion Rosalyn Landor's narrations are overly dramatic, the men all sound 2 decades older than written and the story is ruined. Not a fan. I forgot and used a credit to listen rather than borrow it from my local library. The story was enjoyable and uniquely different. Worth a reread in the future. 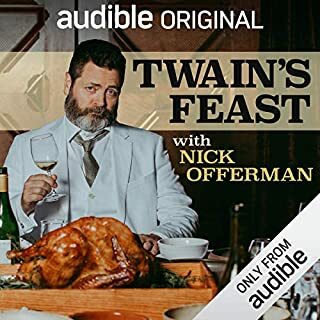 Being a fan of Mark Twain and a foodie, this audio production appealed to me. What delighted me was the sprinkling of the recorded investigations, from speaking with various Twain experts to a recording of a prairie chicken hunt. Those recordings of men gathered to hunt, speaking plainly to each other, teasing each other. just took me back to my girlhood. (Yes, I was so quiet, the men forgot I was there and I treasure those glimpses of men being men ) . Learning what these foods meant to Twain, not just in flavor but his emotional memory is moving. I throughly enjoyed this recording, it's laugh out loud fun. 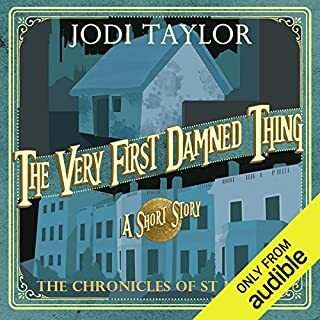 What did you love best about The Very First Damned Thing? Funny. Jodi Taylor read her own book as no one else could, with all the dry humor intact. Totally enjoyed this short story, a fine piece of entertainment. As soon as I finish this review I'll be searching to make sure I haven't missed reading any of Jodi Taylor's books. What fun her writing is, enjoy. What did you love best about The Duchess Deal? Tessa Dare writes fun plots with interesting characters, lots of dialog and little mind babble. If you've enjoyed Tessa Dare's books in the past, you'll love this book. 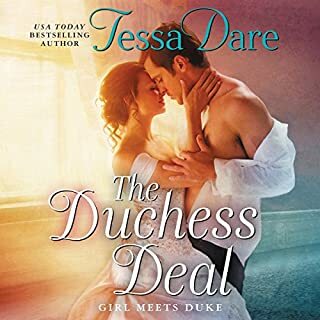 And if you haven't read Tessa Dare's books, you'll read this one and then go looking for her other books. What does Mary Jane Wells bring to the story that you wouldn’t experience if you just read the book? Mary Jane Wells is one of my favorite narrators, she brings a story to life without over doing the drama. Love her narrations and when searching for a new book, I've used Audible's search function for other books Mary Jane Wells has narrated Yes, searched not by author but narrator. Malcolm Bevingstoke, Duke of Haven, has lived the last three years in self-imposed solitude, paying the price for a mistake he can never reverse and a love he lost forever. The dukedom does not wait, however, and Haven requires an heir, which means he must find himself a wife by summer's end. There is only one problem - he already has one. Perhaps in print but not in audio version. Would you listen to another book narrated by Justine Eyre? No, her over dramatization prevents me from actually getting into the story. The male voices are the worst. Usually I complete a book before moving on to another, but this book required breaks. 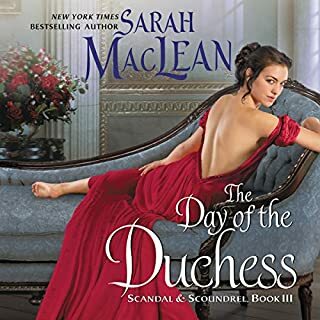 Just couldn't listen for very long even though I've enjoyed Sarah MacLean's books in the past. Trapped in the wrong time, she needs a knight in shining armor, but this damsel in distress might be the real savior. With a day planner attached to her hip, the last thing Katy Tolson wants is a romance that threatens her well-ordered life. She's set to marry the safe - but bland - guy, but something's not quite...right. A careless wish thrusts her through time into medieval Wales and into the arms of a knight in somewhat shining armor. Would you consider the audio edition of Must Love Chainmail to be better than the print version? Yes! Just love Mary Jane Wells's narration. In fact when I'm ready for a book I search by her name, rather than an author, which is how I discovered Angela Quarles's books. What about Mary Jane Wells’s performance did you like? Truly enjoy Angela Quarles's writing skills. A little wit, a little suspension of reality and characters that are well developed make a good read! Can't wait for her future works. Impressed that's she's rather new to writing and has won a Rita already. What did you love best about Four Weddings and a Sixpence? Delightful quick interwoven stories that led to 11 hours of pleasure. What was one of the most memorable moments of Four Weddings and a Sixpence? Most memorable was none of the stories suffered through being stretched to a full length book by use of dumb misunderstandings. The stories just marched on, most pleasantly. Which character – as performed by Mary Jane Wells – was your favorite? I'll be listening to this one again. And checking out the books of the books of those authors new to me. Would you try another book from Laura Landon and/or Sarah Coomes? Anothoer book by Laura Landon - Yes. 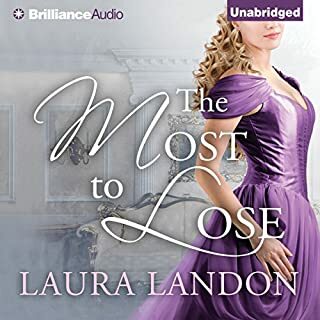 Would you be willing to try another book from Laura Landon? Why or why not? Would you be willing to try another one of Sarah Coomes’s performances? No, Sarah over dramatizes to the point that I just couldn't listen any longer. She has a pleasant voice and her accent is a plus. She needs to believe the story can carry itself and she doesn't need to over dramatize. No one enjoys listening to a drama queen. Her male voice is poor also. Was The Most to Lose worth the listening time? The story, yes. But I just couldn't finish the book due to the narrator. Glad I bought this book through Kindle Unlimited and paid just a few dollars. Wait, the book was free and I PAID only for the narration! How ironic! No, I couldn't recommend this book. The premise is a bit of a romantic comedy and not all of it is poorly written, but not one I'd recommend to friends. Rewrite the areas where the author asks us to believe the H & H miscommunicate and use such poor logic for their decisions. In affect making them both glaringly stupid rather than in love and funny. It was an easy out for the author and needed more effort. What three words best describe Rosalyn Landor’s voice? Personally I don't care for her male voices, they are annoying and total ruin the comedy. The more books I listen to in which she's the narrator, the more I like her less. I'm jarred out of the story when the male lead speaks. Did How to Capture a Duke inspire you to do anything? Inspire me to do anything? Other than to avoid the author and the narrator in the future? It did make me wonder if this is a new author and if so, her editor let her down. On the night of the Parkhurst ball, someone had a scandalous tryst in the library. Was it Lord Canby, with the maid, on the divan? Or Miss Fairchild, with a rake, against the wall? Perhaps the butler did it. All Charlotte Highwood knows is this: It wasn't her. But rumors to the contrary are buzzing. 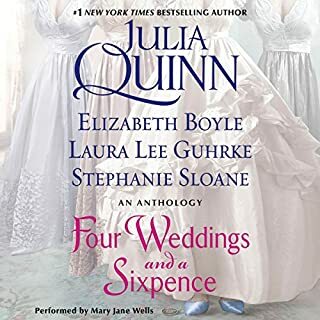 Unless she can discover the lovers' true identity, she'll be forced to marry Piers Brandon, Lord Granville - the coldest, most arrogantly handsome gentleman she's ever had the misfortune to embrace. What would have made Do You Want to Start a Scandal better? Horrible narration, perhaps the story line would have held my attention if the narration wasn't so poorly done. What could Tessa Dare have done to make this a more enjoyable book for you? Who would you have cast as narrator instead of Carmen Rose? Disappointment. I would return this book if I didn't feel responsible for selecting it after I had heard the sample. I'll never purchase or borrow another book narrated by Carmen Rose.